Whilst payment protection insurance UK policies are totally legal, it is the mis-selling of the cover that is against the law. There are certain ways in which a lender can sell loan protection insurance (PPI). If those rules are broken it means that the payment protection insurance has been missold. You are entitled to claim back every penny that the lender charged you for PPI. Our average successful claim is £3500. 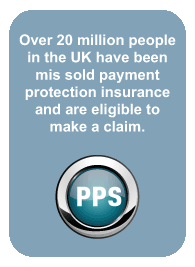 WHAT IS MIS-SOLD PAYMENT PROTECTION INSURANCE (ppi)? Basically, the borrower must be informed that the lender would like him or her to have this cover and clearly explain that it is not compulsory. In the past some lenders told potential borrowers that they must take this cover or they implied that the PPI was a condition of the loan. As well, some lenders simply added the cover to loans without telling borrowers the expensive insurance was added. PPI cover was also sold to customers whose circumstances made them unsuitable such as those over the age of 65. Or the lender may never have asked questions to find out if you actually needed the insurance. There are many ways it could have been mis-sold.